Konami Kukeiha Club - Super Castlevania IV (Original Video Game Soundtrack). Vinyl LP. Bleep. 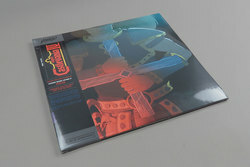 The go-to dealers for video game soundtrack editions Mondo present yet another addition to their Castlevania series, this time pressing up the score for the obscure early 90s adventure Super Castlevania IV. Spread across a double LP, the twenty nine tracks never go beyond the two minute point, some even clocking in at 6 seconds (‘Dracula’s Death’). Whether an avid fan of the video game looking to relive your youth or simply a Mondo completist, this 180g vinyl package shouldn’t disappoint. Crazy 8bit computer music as you’ve come to expect by now!